Does your dog act like he is 100 years old? Do you notice signs of stiffness and inability to move? If that’s the case, then your pet might be suffering from arthritis. As dogs get old, their health starts to deteriorate. Unfortunately, arthritis is not an exclusive condition to mature dogs. It can happen in young and adult pooches as well. A dietary change for arthritic canines is crucial to decrease the symptoms. So what’s the best dog food for arthritis and how to choose one? In today’s post, we will cover causes, prevention, treatment, and nutrition for canine arthritis and review some of the best dog food brands. Wellness Core is our #1 pick when it comes to arthritis. This unique formula offers a combination of natural ingredients and supports your pet well being. It is designed to combat joint diseases. The high-quality animal proteins sourced from deboned turkey, chicken and turkey meal will support lean muscles in your pooch. Additionally, glucosamine and chondroitin will ensure joint health. The Wellness core recipe features an optimum amount of calorie and fat to maintain ideal body weight. On top of that, your dog will have a chance to experience fresh fruits and vegetable. They serve as extra fiber and antioxidant source. This meal doesn’t contain by-products, corn, wheat, artificial additives, and colors. Overall, the Wellness Core WellFlex system will elevate arthritic symptoms and prevent further health issues. Overweight canines often suffer from joint disease. Therefore, weight management should be your main priority. Hill’s Prescription diet is specially formulated to support a metabolic rate and canine mobility. In fact, this recipe has clinically proven properties to improve your pet’s condition. In 21 days your dog will enhance movement and in 60 days decrease body weight. The unique fiber system sourced from fruits and vegetables will further boost metabolism. Omega fatty acids will boost canine’s ability to walk, run, and jump. They will promote healthy skin and a shiny coat. However, this product requires a vet’s prescription. To conclude, Hill’s Prescription formula will keep your pet sated between meals and maintain ideal body weight. Active canines mostly suffer from arthritic disorders. For that reason, Victor food manufacturer mainly uses locally-sourced ingredients. Their formulas target various nutritional needs in canines. Meat comes as the primary protein source. In the case of Performance Dry Dog Food, beef, chicken, and pork meal are the main ingredients. They provide a proper amino acid balance to support muscle development. The product is excellent for young and active pooches, featuring a high level of proteins and only 35% of total carbs. Plus, omega fatty acids will ensure healthy skin and a shiny coat. On top of that glucosamine and chondroitin will promote joint health. Like all other Victor recipes, Performance formulation doesn’t contain soy, wheat, corn, or gluten. In all, if you want to help your pet stay active even throughout his mature years, then Victor Performance food is the right choice for him. 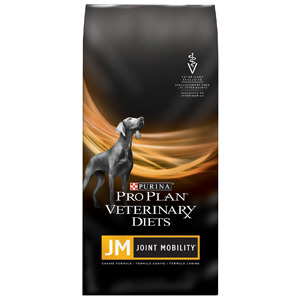 The high concentration of glucosamine, EPA and omega fatty acids make Purina Pro Plan Veterinary the best dog food for joints and bones. It will stimulate mobility and help canines with arthritic disorders, regardless of their age. Natural source of glucosamine promotes cartilage health, while high protein and calorie ratio ensures lean muscles. Additionally, antioxidants will help with the immune system. To sum up, this recipe will change your pet’s life for the better and help him improve the joint condition. Royal Canin Veterinary Diet provides natural and balanced nutrition, and it’s an excellent arthritic dog diet. This product addresses the dietary needs of large breeds. Additionally, it prevents the risks of developing a degenerative joint disease. The risk factors include a variety of conditions. Age, active lifestyle, obesity, genetic predisposition, or trauma can cause arthritis. However, with Royal Canin Veterinary recipe you will improve the mobility of your giant while keeping his joints healthy. The chicken meal comes as a highly concentrated proteins source, which ensures lean muscles. Additionally, DHA and EPA will diminish arthritic symptoms and avert this condition. The bottom line, to improve the quality of your pet’s life, Royal Canin features a combination of premium ingredients. They don’t only boost up the musculoskeletal system but stimulate proper digestion. Dogswell Happy Hips is another product formulated for joint and hip health. This high-quality canned dog food combines supreme proteins, as well as the proper balance of fruits and vegetables. Your pet will have a chance to experience the chunks of delicious lamb mixed with antioxidant-rich fruits and veggies. This food features canneries, spinach, and blueberries. There are no grains, corn, wheat, soy, or artificial additives, to disrupt your dog’s digestive tract. We should point out the presence of healthy supplements for joint and hip care. This formula contains chondroitin, glucosamine and vitamin D-3. In summary, Dogswell Grain-Free Happy Hips recipe will offer you pet high-protein nutrition and help him get healthy again. Basically, you can’t go wrong with this food. It has all the necessary nutrients to support your pet’s musculoskeletal system. Eukanuba is a massive dog food brand famous worldwide. They are always trying to develop meal targeting various health condition in canines. This brand pioneered various nutritional breakthroughs, which many nutritionists use across the globe. The company based its philosophy on the idea that dogs carnivores. For that reason, their food contains high-quality proteins, such as chicken, which keeps millions of pets satisfied. Proteins are formulated to help your dog build lean muscles, and ensure a healthy body. Additionally, recipe keeps your pet’s teeth clean, while promoting fresh breath and healthy gums. Supplements like glucosamine and chondroitin will support joint health in your pet. On the other hand, plenty of antioxidants will build a robust immune system. After all, Eukanuba is one of the brands which uses supreme nutrients and assist your pet in having an active lifestyle. Inside the dog’s joints, a fine layer of cartilage shields the bone surface. The joint fluid ensures that two surfaces glide freely one over another with minimal friction. With arthritic dogs, the cartilage is damaged and becomes less smooth. This condition causes pain when two bone surfaces rub together. As a consequence of this action, a new bone starts to develop around the joint. It disables the movement, causing the muscles and bone stiffness. Based on genetics, they tend to develop joint disease more often than not. Unfortunately, you can’t affect this condition. Considering it’s hereditary, it can appear anytime. Arthritis doesn’t only affect the mature and senior dog, but young adults as well. As your pet ages, his cartilage tends to deteriorate. Therefore, arthritis is a common condition in senior dogs. Active canines are the most affected by this disease. Throughout their life, dogs tend to stay quite energetic and agile which results in a hip or joint dysplasia. However, you can elevate the symptoms by testing the best dry dog food for arthritis. The proper nutrition can diminish the signs and increase movement in your pet. Even though diet can assist canines with joint disease, the lack of nutrients can also affect their body and health overall. You have to be very careful when choosing formulas to treat arthritis. It needs to feature a perfect blend of ingredients, including minerals, vitamins, and supplements. Include supplements like glucosamine and chondroitin. Don’t neglect fresh fruits and vegetables. When in pain, canine doesn’t know how to express his feelings other than showing gestures. You have to agree that arthritis is a painful condition. Every movement causes discomfort, affecting your pet’s mental health. Joint infection can damage cartilage and eventually lead to arthritis. Infection usually happens after trauma or severe injury. In the case of contamination, antibiotics should help. You need to consult your vet for further treatment. Physical activity is a crucial step in eliminating arthritis. What you are trying to accomplish here is to restrict the dog’s movement. However, you still need to stimulate muscle strength. For instance, for young and active canines will have to use a leash. On the other hand, swimming is an excellent way to maintain muscle mass, without stressing the joints. Muscle and joint stiffness is a common sign in puppies suffering from arthritis. In severe cases, pets might develop muscle atrophy due to inactivity. Considering dogs are quite active, the tear and wear are causing the hip joint to become stiff. In this case, pups will have a hard time moving around and will be tied to one position. Limping can is best described as a defensive mechanism, where it protects the hip joint from bearing all the burden of movement. In this case, it decreases the pain, while facilitating the motion. In most case, limping is worse with getting up and becomes less noticeable when dog warms up a bit. When your pet is more reluctant to exercise, or show signs of pain when getting up, then he might have arthritis. Now even the everyday activity represents a challenge for your puppy. Make sure to consult a vet and apply appropriate dog food with glucosamine. Unfortunately, pain comes as an all-too-common occurrence with arthritic disorders. However, pets can’t tell us what’s bothering them, so there is no way to notice signs of pain, only the change in their behavior. If you’ puppy is barking or whining excessively, then something is wrong with this body. Nutrition plays a crucial role in the prevention of joint disease, especially in younger pets. These days, a lot of dog food brands formulate their recipes by targeting specific health conditions. The weight management might be the most crucial measure of them all. Even a few pounds can make a significant difference to our hurting canines. Excess of weight additionally stresses the joints, casing higher traction. It significantly worsens this condition. With dogs suffering from arthritis increased activity is out of the question. So you should consider reducing the treats and choosing a specialized diet for your pet. Glucosamine and chondroitin are two of the supplements that have been widely popular in the last couple of years. They treat both animal and human osteoarthritis. Considering these supplements have been around for a while, they have displayed significant healing properties with joint disease. Glucosamine is a central component of cartilage. On the other hand, chondroitin directly impacts on the formation of cartilage and prevents its deterioration. With healthy canines, regular physical activity is mandatory. It’s one of the ways to prevent arthritis and boost up muscle mass. Exercise will maintain body healthy, as well as ligaments and tendons surrounding the joints. When the supporting tissue becomes weak or loose, it can speed up the arthritic process. However, physical activity promotes the production of joint fluid which lubricates the joints and protects the cartilage. Anti-flea and tick products may contain pesticides which can disrupt body balance. On top of that, they affect the musculoskeletal system. When resorting to these solutions, either use natural remedies or products with approved components. Professional help is essential with any case of arthritis. Even though you may try to aid the initial symptoms, further analysis and tests are required to determine your pet’s condition. In this case, only the vet can assist your pooch with further recovery. Lifestyle changes – they include weight management, appropriate diet, and orthopedic memory foam bed. Massage – a gentle massage will stimulate the lymphatic system, eliminate toxins, and relieve pain. Acupuncture – this ancient practice utilizes five central components of TCM. With acupuncture, thin needles are used to direct, stimulate and balance energy flow through the body. Scientific evidence indicates that acupuncture can reduce inflammation and elevate pain. Hydrotherapy – swimming will strengthen the muscles while being gentle on tender joints. Medication – veterinarians usually recommend nonsteroidal anti-inflammatory drugs to relieve pain. Surgery – in the most severe cases, you’ll have to resort to surgery, where joint or tissue replacement is required. Whether you are breeding a puppy or a mature canine, make sure to choose appropriate nutrition targeting his age. For that reason, many dog food companies separate their formula to accommodate puppies, adult, and senior pooches. When purchasing a recipe for your arthritic pet, pay attention to his age. The variations in the ingredient list significant influence his wellbeing. So, instead of helping your dog, food can worsen his condition. Glycosaminoglycan such as glucosamine and chondroitin produce cartilage-forming cells. These compounds create building blocks necessary to synthesize new cartilage and repair the existing damage. Make sure to know that products containing these supplement won’t elevate the pain, but rather repair the joint damage. Considering they are naturally occurring compounds, glucosamine and chondroitin are safe to use. They show very few side-effects, which don’t affect your pet’s health. Vitamin C – is a crucial component in synthesizing cartilage and collagen. Additionally, it features antioxidant and anti-inflammatory properties. Omega- 3 fatty acids are considered to be the first line of defense when combating arthritis. For instance, fish oil, like salmon, is enriched with omega-3 fatty acid which aids inflammation and it’s a natural antioxidant. This further implies your pet won’t feel any side-effects, even with prescribed medications. Make sure to avoid cheaper substitutes, such as corn or sunflower oil. Dog nutrition should have plenty of antioxidants. They are part of the defense system fighting free radicals. Antioxidants will repair cells, and prevent many conditions and metabolic disorders. Recent studies show that antioxidants can elevate swelling and pain of joint disease and prevent further damage. Many Grains are linked to allergies and inflammation, which irritate dogs with arthritis or joint pain. Essentially, dog food doesn’t need to contain grain. It’s a cheap filler that lacks nutritional value. The best dog food for joint support is grain-free, and it’s never the primary protein source. Fatty meats can harm your pet’s wellbeing, additionally stressing his joints. Some dog food brands tend to add animal fat, which is a cheap protein, making nutrition more affordable. The joint care dog food should contain premium proteins such as chicken or turkey meat. Sometimes homemade meals can serve as an additional boost to help your pet combat arthritis. We are going to share one recipe, which is quite easy to prepare. Oats, chicken, and carrots should be cooked and then mixed with the rest of the ingredients. What is the best over the counter pain reliever to give? The most common over-the-counter pain medications involve aspirin, ibuprofen, and naproxen. Even though they are quite successful in relieving the pain; you should avoid this kind of approach. Consult your vet before you administer any drug. What are the home remedies to help? Comfrey – it’s famous for its anti-inflammatory and pain-relieving properties. You can add one tablespoon to your pet’s food. Yucca – it is often used in arthritic medications for human and animal consumption. You can find it in any health food store. Alfalfa – is another widely spread herb used for inflammation and pain management. Make sure to buy an organic plant because it’s often genetically modified. Unfortunately, arthritis is an incurable condition, but it doesn’t mean you can’t help your canine lead a comfortable life. Dog diagnosed with arthritis can reach mature years if he has proper care. This disorder doesn’t have to influence his lifespan. Are treats safe for senior arthritic dogs? Considering too many treats lead to obesity, you should be careful when feeding your senior canine. Make sure to have a strict feeding schedule. However, you can award your pet for good behavior from time to time. If you resort to this type of nutrition, then serve your pet with healthy, low-sodium, low-fat treats, or the best dog food for older dogs with arthritis. Even though arthritis is a chronic condition, there a plenty of things you can do to improve the quality of life of your pooch. Both pet parents and dogs are affected by this disease, so they need some time to get around. However, diet plays a crucial role and should be your highest priority. These days, a lot of recipes are formulated to target arthritis. You can check out the product we reviewed. They all feature premium ingredients and are designed to help your pooch combat this disorder.